The post Is Benadryl Safe for Dogs? What to Know About Benadryl for Dogs by Melvin Pena and Stephanie Osmanski appeared first on Dogster. Copying over entire articles infringes on copyright laws. You may not be aware of it, but all of these articles were assigned, contracted and paid for, so they aren’t considered public domain. However, we appreciate that you like the article and would love it if you continued sharing just the first paragraph of an article, then linking out to the rest of the piece on Dogster.com. Is Benadryl safe for dogs? The answer depends on a few different factors. Photography © Photoboyko | iStock / Getty Images. Is Benadryl safe for dogs? First, let’s look at what Benadryl is. Giving dogs Benadryl, like any human medication, can be a dicey proposition. While it is among the most commonly prescribed over-the-counter medicines that veterinarians recommend for dogs, it is not without its risks. So, the answer to, “Is Benadryl safe for dogs?” really depends. Let’s look at dog health conditions that Benadryl may help with and ways it can be administered — after consulting with your vet. Is Benadryl safe for dogs with allergies? When you hear “environmental allergies,” you may think of pollen, dust or mold, things typically found in both our indoor and outdoor environs that trigger allergic reactions. We express these through sneezing, watery eyes, and other responses we associate with our respiratory system. Dogs can react to the same stimuli, but in radically different ways. Atopic dermatitis is their most frequent allergic reaction, and involves scratching that starts at the head before encompassing the whole body. Depending on the severity of a dog’s allergies, cortisone is far more effective than Benadryl for dogs. 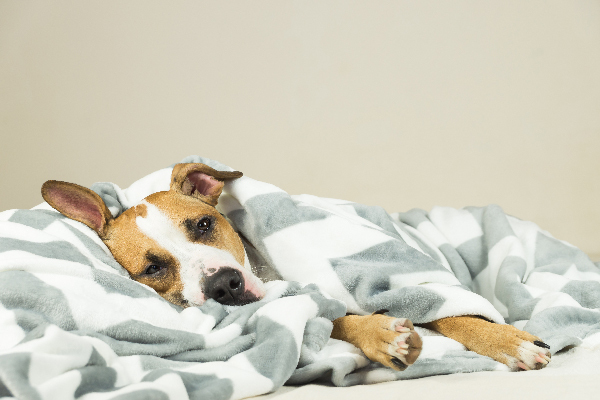 Benadryl isn’t the only form of diphenhydramine, though, and your vet can recommend better ones for these sorts of allergic reactions. Is Benadryl safe for dogs with insect stings and parasite bites? Dog allergies also include adverse reactions to bites and stings. An upset bee or wasp, or a particularly vicious flea bite on your dog’s body can provoke similar scratching. So, is Benadryl safe for dogs — who have gotten bitten or stung? Treating these kinds of dog allergies with Benadryl is a far more reliable use of the drug. The dog’s skin may reveal more in these cases than their responses to environmental allergies. You may notice swelling in particular, along with a rising skin temperature. If swelling and a rising skin temperature is something you recognize in your dog and you can also pinpoint the origin of a bite or sting, then it might be safe to administer the correct dosage of Benadryl to your dog — after consulting with your vet. “If a dog is stung by a bee or bitten by another insect Benadryl, or its generic equivalent diphenhydramine, is safe to give at a dose of about 1 milligram per pound of body weight up to every eight hours,” says Dr. Ben J. Carter, a veterinarian-and-owner at the Animal House Veterinary Center in Delray Beach, Florida. “For example, if a dog weighs 50 pounds, he or she can safely be given 50mg (2 tablets). Most Benadryl are 25mg, but check the packaging to be sure,” Dr. Carter advises. In the event that your pet is experiencing a severe or “acute” allergic reaction, one signified by facial swelling and difficulty breathing, it is best to forgo home remedies. Instead, take your dog straight to the veterinarian so that a professional can access the situation and decide on treatment accordingly. Is Benadryl safe for dogs with anxiety? Is Benadryl safe for dogs with anxiety? Photography ©hidako | Thinkstock. Dogs experience and express anxiety in any number of scenarios, from separation anxiety to adversely reacting to meeting new people and dogs. 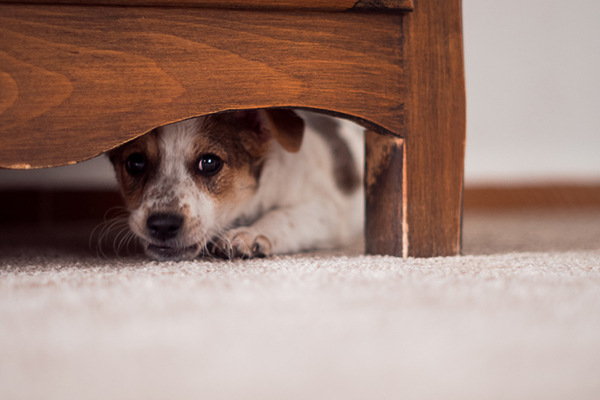 Whether it’s protracted noises from construction, thunderstorms or fireworks displays, or the restriction of movement that comes with being put in a crate when guests arrive, some dogs have extreme reactions to anxiety. The answer to, “Is Benadryl safe for dogs with anxiety?” depends. One of Benadryl’s more interesting, as well as risky, off-label uses, is as a very mild sedative in dogs. Certain drugs that are capable of quickly moving from the blood into the brain, like Benadryl’s active ingredient diphenhydramine, have calming, even mildly sedative properties. Because it can pass into the brain so rapidly, usually taking effect within 30 minutes after ingestion, Benadryl’s fast-acting nature might be useful to treat occasional and anticipated episodes of anxiousness. Is Benadryl safe for dogs experiencing motion sickness? As a sedative, another major off-label usage for Benadryl is for dogs who can be counted on to experience motion sickness, whether by land, sea or air, during infrequent travel. When a long trip is planned and the dog is along for the ride, motion sickness can cause some dogs a great deal of stress. Canine reactions can range from restlessness to barking, and from vomiting to defecation. If thundershirts, music or restricting a dog’s line of sight have proven ineffective in the past, ask your veterinarian if Benadryl might make your dog sufficiently drowsy to endure a long voyage. Keep in mind that, as with other sedative medications, there may be lingering effects once the trip is concluded. There may be disorientation and continued grogginess, which is one reason any human medication you employ with your dog should be under veterinary supervision and used very rarely. Is Benadryl safe for dogs who are hyper? Diphenhydramine may have a wide safety margin, but it’s worth repeating the scientific name to remind ourselves that it is still a powerful and fast-acting drug that should not be used casually. By that, we mean that it is not recommended if your dog is barking late at night or otherwise bothering you and you just want them to settle down. Yes, Benadryl can make your dog drowsy and sleepy, but it is not intended to be used on a regular basis as a dog tranquilizer. Regular and consistent exercise is a much more effective and drug-free method for soothing an overactive dog. Aside from the multiple formulas — regular strength, extra strength, or any other variation which may include additional, less-safe active ingredients — Benadryl is available in a number of formats. From ingestibles, including pills, tablets, gel caps and liquid varieties, there are also infant and children’s versions, and topical creams that have diphenhydramine as their active ingredient. The type, strength and formula can all make a difference, and have a distinct impact on a dog. Always consult with your dog’s veterinarian before giving a dog any kind of human medication. Every piece written by canine health specialists and veterinarians on the internet agrees with a very basic dosage standard for dogs. The most thorough treatment of Benadryl dosage by format that we consulted addresses each format and provides warnings and cautions for each. The rule of thumb for regular-strength Benadryl, where diphenhydramine is the only active ingredient is 1mg per 1lb of body weight. That is only a rule of thumb, not an infallible nor universal guideline. Naturally, a Chihuahua, a Pug or a Yorkie will need less than a Bulldog or a Great Dane. So, is Benadryl safe for dogs? It depends and you should always consult with your vet when it comes to Benadryl for dogs. It is important to remember that this family of human over-the-counter medications, while frequently recommended by vets, is not FDA-approved as a medicine for dogs, per se. Sleepiness is one side effect you know of; it may surprise you to learn that another is excitability and an increased heart rate. Other side effects of Benadryl for dogs include increased drooling, panting and depression. They are rare, but there have also been reported and documented instances of dogs who have fatally overdosed on diphenhydramine, especially when its ingested with other chemicals. Take care of your dogs, and always seek veterinary advice before administering any OTC product to them.